Emma Watson (15 April 1990) is a British actress and social activist. She rose to prominence through her role as Hermione in the Harry Potter film series. In recent years, she has been a spokesperson on women’s rights and other social issues. In 2014, she was appointed a UN Women Goodwill Ambassador and helped to launch the UN Women campaign HeForShe, which campaigns for gender equality. She studied at Brown University (US) and Worcester College, Oxford University, graduating with a BA in English literature in 2014. Emma Watson was born in Paris to English parents. From the age of five, she was brought up in Oxfordshire and London. Watson attended the Stagecoach Theatre Arts. She also was a student at the Dragon School, Oxford and later Headington School. She appeared in several amateur school productions. In addition, she spent much time practising drama and learning the skills of an actress. In 1999, Watson was invited to auditions for the upcoming Harry Potter and the Philosopher’s Stone film. She attended eight auditions, and the producer David Heyman was impressed with her confidence and acting ability. J.K.Rowling took an instant like to Watson and wanted her to play Hermione from the first audition. 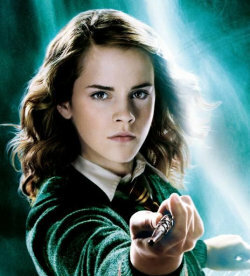 She was given a lead role of playing Hermione – one of the best friends of Harry Potter. Hermione had characteristics of being smart, bossy and a voice of reason. Even from an early age, people commented Watson was quite outspoken, and her natural assertiveness grew with the character. The first instalment of the series was released in 2001, to popular and critical acclaim. Watson’s performance of Hermione was praised by critics, and the film went on to become the highest-grossing film of 2001. Between 2001 to 2011, she appeared in all seven Harry Potter films and became an international teen star as the films became increasingly popular, regularly breaking records for the highest grossing films. Watson’s performances were often praised – her increasingly mature and spiky performance of Hermione providing tension and counterbalance to that of her co-stars Daniel Radcliffe (Harry Potter) and Rupert Grint (Ron). The final two books Harry Potter and the Half-Blood Prince and Harry Potter and the Deathly Hallows were filmed from 2008 to 2010, with the final film in the series Harry Potter and the Deathly Hallows – Part 2 released in July 2011. It was the cumulation of one of the most successful film series in history and cemented Watson’s role as a leading female, young actor. Watson was gifted academically, achieving eight A* and two A at GCSE. These results were achieved despite long hours in working on the Harry Potter films. As the Harry Potter franchise came to an end, Watson became keen to break out from her role as Hermione and branch into new endeavours. In 2005, Watson began a modelling career, appearing on the front of Teen Vogue. She has also worked as a model for Burberry and Lancome. She also acted as an advisor for People Tree, a fair trade fashion brand. In July 2014, Watson was appointed a UN Women Goodwill Ambassador and later in the year gave an address at the United Nations in New York. Her speech was part of the UN Women Campaign HeForShe which sought to try and involve more men in the campaign for equal rights between men and women. Watson sought to refresh the concept of feminism – to get away from the idea of ‘man-hating’, but include men in the process of greater equality. The speech garnered widespread international coverage and received widespread praise. However, it also led to anonymous death threats and hate mail, which caused Watson to be afraid, but also more determined to continue her work. Watson’s beliefs stemmed from her own experiences of growing up. In particular, her disapproval of the media’s attempt to sexualise her life, at aged only 14. Since this moment, she has participated in many events which have sought to promote women’s rights and women’s political participation. Nobel Laureate, Malala Yousafzai said Watson’s speech was helpful for her to see ‘Feminism’ as something she could identify with, without negative connotations. In 2016, Watson started a feminist book club.